Dads! Moms! Kids! Welcome to the absolutely most intense thrill ride in Las Vegas, "The Big Shot!" The Stratosphere Hotel and Casino is the tallest freestanding observation tower in the United States zooming into the Las Vegas sky at a whopping 1,149 feet. Now, imagine this-The Big Shot attraction is mounted at the very tip top of the tower! Parents and children will begin their adventure at this hotel on their way up to The Big Shot attraction. This Vegas hotel is home to an elevator that travels three floors per second! At a speed of 1,800 feet per minute, parents, be prepared for the kids to say that their ears are popping as you arrive at the upper levels of this iconic tower. Mom and dad along with the children will be mesmerized by the breathtaking views seen from the observation deck. From this height your family can take in the panoramic sights of the entire Las Vegas Strip, downtown Vegas, and the majestic mountains surrounding the valley while the kids try to point out the hotel where you are staying. Adults will enjoy checking out the Top of the World spinning restaurant while the children take a peek inside the sky-high wedding chapel. After the attendants strap everyone into their over-the-shoulder harnesses, your family will begin to feel the air filling up inside the compressors and you actually start floating out of your seats. At this very moment, the kids their parents and yes, even dad, are wondering if there is time to change their minds. But-before this thought has ended-you blast off! Guaranteed to feel like the longest 2.5 seconds of your life as you experience 4 Gs of force giving the whole family the feeling of weightlessness at its peak. Just when you think there's nothing more intense, you will free-fall at negative G force, experience a couple of bounces, and then realize that you are surrounded by the most captivating views of Las Vegas ever imagined-all while hanging out there, legs and arms exposed, right out there in the nothingness! Rides taken at night provide the most jaw-dropping view of Vegas, boasting the most neon glitz in the entire world, yeah Baby! Las Vegas! Some people want to scream but can't. Some people just can't stop screaming. Some just giggle from the intensity of the experience. Just the height alone is terrifying! Every single person will forever consider themselves Las Vegas Big Shots. This attraction will make each of you a hero whether you started out as just a thrill seeker or a daredevil. Going home from this Vegas vacation will make all parents and their kids stand just a little taller with this Big Shot experience under their belts. Not only did your family just vacation in the most talked-about city in the entire world but each one of you just blasted off the tallest tower in the United States, 1,000 feet above the earth! Oh! As if that wasn't enough psychological fear, you can next experience 'SkyJump Las Vegas' before leaving the Stratosphere Tower. 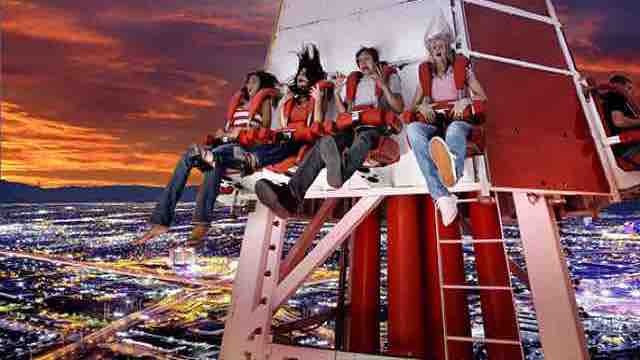 This Vegas thrill ride sends you jumping off the 108th floor of this resort. An amazing 100 foot controlled free fall off a tower in the desert. Sunday through Thursday, 10 am until 1 am. Friday, Saturday and Holidays, 10 am until 2 am. This schedule is subject to change in cases of extreme weather. Children 15 years or younger must be accompanied by a parent or legal guardian. Kids must be at least 48' tall! The Las Vegas Stratosphere Hotel and Casino is located at 2000 Las Vegas Blvd. South, Las Vegas, Nevada. For additional information please visit their website at www.stratospherehotel.com or call 1-800-998-6937.